Osteomyelitis refers to a bone infection, almost always caused by a bacteria. Over time, the result can be destruction of the bone itself. Bone infections may occur at any age. Certain conditions increase the risk of developing such an infection, including sickle cell anemia, injury, the presence of a foreign body (such as a bullet or a screw placed to hold together a broken bone), intravenous drug use (such as heroin), diabetes, kidney dialysis, surgical procedures to bony areas, untreated infections of tissue near a bone (for example, extreme cases of untreated sinus infections have led to osteomyelitis of the bones of the skull). Staphylococcus aureus, a bacterium, is the most common organism involved in osteomyelitis. Other types of organisms include the mycobacterium which causes tuberculosis, a type of Salmonella bacteria in patients with sickle cell anemia, Pseudomonas aeurginosa in drug addicts, and organisms which usually reside in the gastrointestinal tract in the elderly. Extremely rarely, the viruses which cause chickenpox and smallpox have been found to cause a viral osteomyelitis. Spread via the bloodstream; 95% of these types of infections are due to Staphylococcus aureus. In this situation, the bacteria travels through the bloodstream to reach the bone. In children, the most likely site of infection is within one of the long bones, particularly the thigh bone (femur), one of the bones of the lower leg (tibia), or the bone of the upper arm (humerus). This is because in children these bones have particularly extensive blood circulation, making them more susceptible to invasion by bacteria. Different patterns of blood circulation in adults make the long bones less well-served by the circulatory system. These bones are therefore unlikely to develop osteomyelitis in adult patients. Instead, the bones of the spine (vertebrae) receive a lot of blood flow. Therefore, osteomyelitis in adults is most likely to affect a vertebra. Drug addicts may have osteomyelitis in the pubic bone or clavicle. Spread from adjacent infected soft tissue; about 50% of all such cases are infected by Staphylococcus aureus. This often occurs in cases where recent surgery or injury has result in a soft tissue infection. The bacteria can then spread to nearby bone, resulting in osteomyelitis. Patients with diabetes are particularly susceptible to this source of osteomyelitis. The diabetes interferes with both nerve sensation and good blood flow to the feet. Diabetic patients are therefore prone to developing poorly healing wounds to their feet, which can then spread to bone, causing osteomyelitis. Acute osteomyelitis refers to an infection which develops and peaks over a relatively short period of time. In children, acute osteomyelitis usually presents itself as pain in the affected bone, tenderness to pressure over the infected area, fever and chills. Patients who develop osteomyelitis, due to spread from a nearby area of soft tissue infection, may only note poor healing of the original wound or infection. Adult patients with osteomyelitis of the spine usually have a longer period of dull, aching pain in the back, and no fever. Some patients note pain in the chest, abdomen, arm, or leg. This occurs when the inflammation in the spine causes pressure on a nerve root serving one of these other areas. The lower back is the most common location for osteomyelitis. When caused by tuberculosis, osteomyelitis usually affects the thoracic spine (that section of the spine running approximately from the base of the neck down to where the ribs stop). When osteomyelitis is not properly treated, a chronic (long-term) type of infection may occur. In this case, the infection may wax and wane indefinitely, despite treatment during its active phases. An abnormal opening in the skin overlaying the area of bone infection (called a sinus tract) may occasionally drain pus. 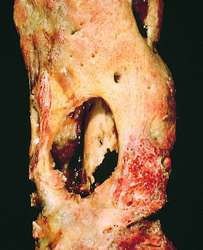 This type of smoldering infection may also result in areas of dead bone, called sequestra. These areas occur when the infection interferes with blood flow to a particular part of the bone. Such sequestra lack cells called osteocytes, which in normal bone are continuously involved in the process of producing bony material. Diagnosis of osteomyelitis involves several procedures. Blood is usually drawn and tested to demonstrate an increased number of the infection-fighting white blood cells (particularly elevated in children with acute osteomyelitis). Blood is also cultured in a laboratory, a process which allows any bacteria present to multiply. A specimen from the culture is then specially treated, and examined under a microscope to try to identify the causative bacteria. When pockets of pus are available, or overlaying soft tissue infection exists, these can serve as sources for samples which can be cultured to allow identification of bacteria present. A long, sharp needle can be used to obtain a specimen of bone (biopsy), which can then be tested to attempt to identify any bacteria present. Antibiotics are medications used to kill bacteria. These medications are usually given through a needle in a vein (intravenously) for at least part of the time. In children, these antibiotics can be given by mouth after initial treatment by vein. In adults, four to six weeks of intravenous antibiotic treatment is usually recommended, along with bed-rest for part or all of that time. Occasionally, a patient will have such extensive ostemyelitis that surgery will be required to drain any pockets of pus, and to clean the infected area. General recommendations for the treatment of infections include increasing vitamin supplements, such as vitamins A and C. Liquid garlic extract is sometimes suggested. Guided imagery can help induce relaxation and improve pain, both of which are considered to improve healing. Herbs such as echinacea (Echinacea spp. ), goldenseal (Hydrastis canadensis), Siberian ginseng (Eleutherococcus senticosus), and myrrh (Commiphora molmol) are all suggested for infections. Juice therapists recommend drinking combinations of carrot, celery, beet, and cantaloupe juices. A variety of homeopathic remedies may be helpful, especially those used to counter inflammation. Prognosis varies depending on how quickly an infection is identified, and what other underlying conditions exist to complicate the infection. With quick, appropriate treatment, only about 5% of all cases of acute osteomyelitis will eventually become chronic osteomyelitis. Patients with chronic osteomyelitis may require antibiotics periodically for the rest of their lives. About the only way to have any impact on the development of osteomyelitis involves excellent care of any wounds or injuries. Calhoun, Jason H., et al. "Osteomyelitis: Diagnosis, Staging, Management." Patient Care 32 (January 30, 1998): 93+. Abscess — A pus-filled pocket of infection. Humerus — The bone of the upper arm. Thoracic — Pertaining to the area bounded by the rib cage. Tibia — One of the two bones of the lower leg. inflammation of bone, localized or generalized, due to an infection, usually by a pyogenic organism. It may result in bone destruction, in stiffening of joints if the infection spreads to the joints, and, in extreme cases occurring before the end of the growth period, in the shortening of a limb if the growth center is destroyed. Acute osteomyelitis is caused by bacteria that enter the body through a wound, spread from an infection near the bone (exogenous osteomyelitis), or come from a skin or throat infection (endogenous osteomyelitis). The infection usually affects the long bones of the upper and lower limbs and causes acute pain and fever. It most often occurs in children and adolescents. Onset may be sudden, with chills, high fever, and severe pain. Signs and symptoms include a marked increase in leukocytes; tenderness, swelling, and redness of the skin over the bone involved; and bacteremia. About 10 to 14 days after the onset of symptoms, x-rays show signs of the bone infection. Intravenous antibiotic treatment is usually effective. If not, the infection destroys areas of the bone and an abscess forms. Acute osteomyelitis may become chronic, especially if the patient has a low resistance to infection. Bone metabolizes more slowly than other organs and its blood supply is less generous than that to other organs. Aggressive intravenous antibiotic therapy is essential. Treatment. Treatment of acute osteomyelitis consists of administration of antibiotics and sometimes surgical drainage of the abscess. Fragments of dead bone (sequestra) that remain and prevent healing must be removed surgically. If the blood supply to the bone is not obstructed, the bone can grow back. Treatment of chronic osteomyelitis is similar to that for the acute type. Osteomyelitis. The bacteria reach the metaphysis through the nutrient artery. Bacterial growth results in bone destruction and formation of an abscess. From the abscess cavity, the pus spreads between the trabeculae into the medulla, through the cartilage into the joints, or through the haversian canals of the compact bones to the outside. These sinuses traversing the bone persist for a long time and heal slowly. The pus destroys the bone and sequesters parts of it in the abscess cavity. Reactive new bone is formed around the focus of inflammation. From Damjanov, 2000. Garré's osteomyelitis sclerosing nonsuppurative osteomyelitis. salmonella osteomyelitis osteomyelitis due to salmonella organisms; it occurs more frequently than normal in sickle cell disease. sclerosing nonsuppurative osteomyelitis a chronic form involving the long bones, especially the tibia and femur, marked by a diffuse inflammatory reaction, increased density and spindle-shaped sclerotic thickening of the cortex, and an absence of suppuration. Inflammation of the bone marrow and adjacent bone. Garré's osteomyelitis , sclerosing nonsuppurative osteomyelitis a chronic form involving the long bones, especially the tibia and femur, marked by a diffuse inflammatory reaction, increased density and spindle-shaped sclerotic thickening of the cortex, and an absence of suppuration. A usually bacterial infection of bone and bone marrow in which the resulting inflammation can lead to a reduction of blood supply to the bone. local or generalized infection of bone and bone marrow, usually caused by bacteria introduced by trauma or surgery, by direct extension from a nearby infection, or via the bloodstream. Staphylococci are the most common causative agents. observations The long bones in children and the vertebrae in adults are the most common sites of infection as a result of hematogenous spread. Persistent, severe, and increasing bone pain; tenderness; guarding on movement; regional muscle spasm; and fever suggest this diagnosis. Draining sinus tracts may accompany posttraumatic osteomyelitis or osteomyelitis from a contiguous infection. Specific diagnosis and selection of therapy depend on bacterial examination of bone, tissue, or pus. interventions Treatment includes bed rest and parenteral antibiotics for several weeks. Surgery may be necessary to remove necrotic bone and tissue, obliterate cavities, remove infected prosthetic appliances, and apply prostheses to stabilize affected parts. Chronic osteomyelitis may persist for years with exacerbations and remissions despite treatment. nursing considerations Normal precautions are used in disposing of any drainage. Absolute rest of the affected part may be necessary, with a careful positioning using pillows and sandbags for good alignment. During the early phase of infection, pain is extremely severe, and extraordinary gentleness in moving and manipulating the infected part is essential. osteomyelitic, adj. Orthopedics Bone infection, usually bacterial, which may be 2º to infection elsewhere in the body that spreads hematogenously to bone predisposed to infection by minor trauma in the region resulting in a blood clot; in children, long bones are affected; in adults, vertebrae and pelvis. See Cervical osteomyelitis. Synonym(s): central osteitis (1) . An infection of all elements of bone, including the PERIOSTEUM and the bone marrow, usually with staphylococci (see STAPHYLOCOCCUS). The disease is commonest in children, and causes fever and severe pain at the affected site. Intensive antibiotic treatment is necessary to avoid a long-term problem with abscess formation and death of an isolated piece of bone (sequestrum formation). n an inflammation of the bone marrow or of the bone, marrow, and endosteum. inflammation of bone, localized or generalized, due to a pyogenic infection. It may result in bone destruction, in stiffening of joints if the infection spreads to the joints, and, in extreme cases occurring before the end of the growth period, in the shortening of a limb if the growth center is destroyed. Specific osteomyelitides in animals are actinomycosis and necrotic rhinitis of pigs. Clinical signs include persistent, severe pain, surrounding cellulitis sometimes with sinuses to the exterior. The affected bone is subject to pathological fracture and is readily recognizable radiographically. There are local signs related to the position and function of the affected bone, e.g. lameness, inability to eat. causes abnormal posture and motor difficulties including stumbling, then stiff and restricted gait, reluctance to bend neck, resulting in kneeling to graze. In healthy children, severe abdominal pain, diarrhea and locomotor system findings following Salmonellosis should be cared and evaluated in terms of Salmonella osteomyelitis or septic arthritis. A rare case of Salmonella osteomyelitis in the humerus as a differential diagnosis to a malignant bone tumor.